New Website Launched for Byrne Byrne and Company! Does your website inspire new visitors to learn more, or think they entered a time-capsule to 1898? The home screen of your website is the first touch for most potential clients! It’s important to create a visually-appealing, easy-to-navigate site that tells your brand story and showcases your services. 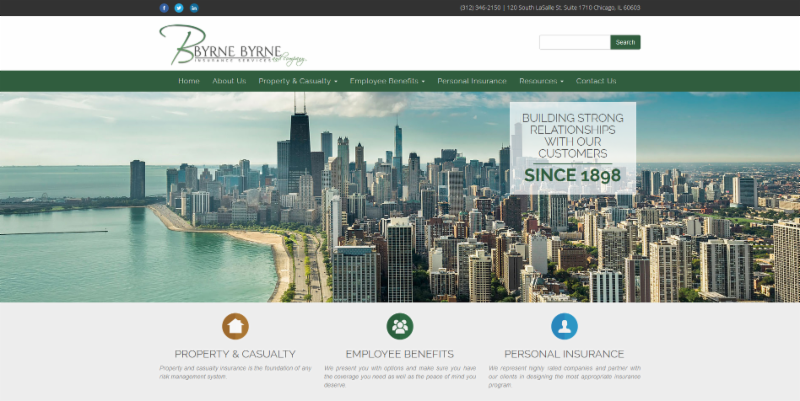 We’re excited about our latest website redesign for Byrne Byrne and Company, based in Chicago, which features a sweeping skyline backdrop. The site is mobile-responsive, clean and concise, and provides a one-stop resource for potential and current clients. Visit the new Byrne Byrne and Company website at byrnebyrne.com! Byrne Byrne also utilizes our social media marketing solution which includes posting relevant blogs on industry topics, creating and managing social media company pages on Facebook, LinkedIn and Twitter and publishing personalized content from company outreach initiatives! Contact us to learn more about custom website design, SEO optimization, email marketing and social media solutions!